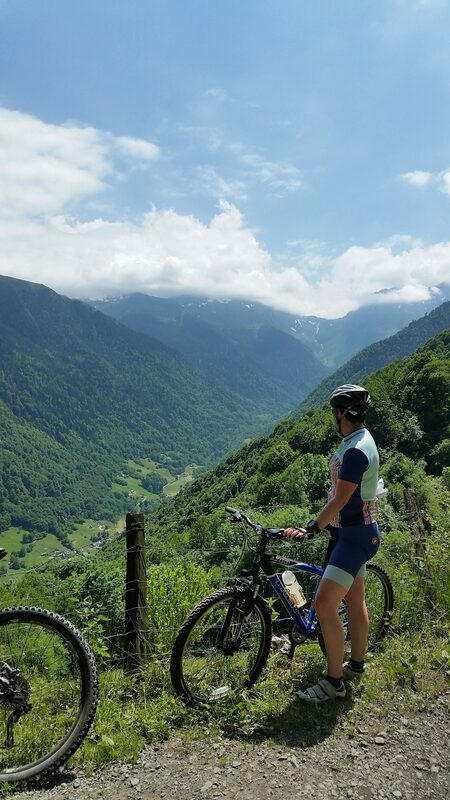 The Vallée de Lesponne is a hidden gem of the Pyrénées and a paradise for any walkers or cyclists. It is a twelve-kilometre-long cul de sac leading into the heart of the mountains and as you turn into Lesponne Valley at Beaudéan from the road leading from Bagnères-de-Bigorre to Tourmalet you are slowly transported back in time. As you progress up the valley past the pretty hamlets and small holdings you will hear the gentle background sound of running water and the tinkle of cow bells. The valley road eventually runs alongside the river Adour before climbing up towards the beech forest and waterfalls at the foot of the Pic du Montaigu (2332 m). The last hamlets now give way to occasional stone bergeries, scattered pastures, and dense forest, all with the spectacular backdrop of the mountain peaks. The valley road ends at Chiroulet which is the starting point for many beautiful walks. The lack of any through traffic has allowed the valley to retain the authentic character and charm of an age long passed. There are several restaurants within a distance of 6km from River Cottage and the nearest is a ten-minute walk away. A short fifteen-minute drive away is Bagnères-de-Bigorre , an ancient Roman spa town where every Saturday there is a fabulous street market. Local farmers and artisan producers come to sell their produce to enthusiastic customers who can also enjoy the lively indoor market with its tapas and oyster bars. The ancient spa in Bagnères-de-Bigorre is still very much in use today with people from all over France being prescribed therapeutic treatments there. Although visitors to the town cannot use these facilities, they are more than welcome to relax at the public spa, Aquensis, which is an ideal place to relax after a day of activities.